It’s been a year and a half that I have been working here at CloudFactory and every single day is a bliss with warm smiles all around the office. My job is the type of job where I meet different people every day, week or month. My extrovert character plays a vital role in those instances, and I deal with this phenomena of meeting new people quite easily. Meeting new people is always exciting because of the distinction in characters and the real stories behind them. 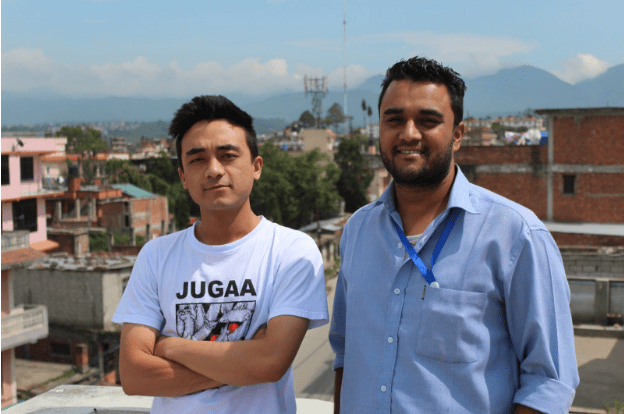 This story also relates to a hunk, Sakar Shrestha, whom I met more than a year ago and have been working together since. I still remember the first time we met in one of the team meetings of CloudFactory. Sakar was introduced to me by the team leader of the “Engineer’s Team”, and his friendly attitude was very welcoming. Despite this being our first meet up, he spoke very frankly and his friendly attitude was noticed at the first instance. Over time we got to know each other better and our friendship grew. The more I got to know about him, the more I became fascinated by his story. He is an engineering student at the moment, has an immense craze for music and is a keen explorer. I see his annual hiking pictures which make me a bit jealous at times. He loves music and his main passion is drumming. I remember a specific team meeting where he asked his team member if the payments were made on regular basis or not. Upon further inquiry, I came to know he was not checking his bank account and was not withdrawing any of the amount that he was earning via CloudFactory because he wanted to buy a drumming instrument for himself. That takes a lot of passion and dedication which made him fall into my spot light straight away. Like I mentioned earlier, he happens to be an annual explorer, I see his visits and hikings on Facebook, the pictures are always fascinating. I see him around in office a lot of the times for in-house work and he is always happy and thankful to CloudFactory for the opportunity he is presented with. We have so many people connected with us at CloudFactory who are grateful for the opportunity, but most don’t express it. This lad never stops appreciating and being grateful for the opportunity that he is being presented with at the moment. Being a student, it is very difficult to maintain studies while working at a part time job, but working with CloudFactory provides flexible hours of work and the flexibility of working from home for him. The way he appreciates this opportunity is really amazing, and I really wish this was a common understanding. If we think deeply, there are many others who are in real need on the waiting list. When workers hold onto an opportunity, but don’t properly use it, they are keeping others from being able to tap it. We must always be grateful towards what we have and also must learn to let things go at the right time.